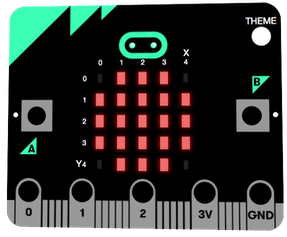 Here are a couple of projects for the BBC micro:bit to download and try out for yourself! This is a novelty brake/tail light for your bike, scooter, skateboard, or R/C car! Using the accelerometer it will make a bright brake light come on when you brake, and if you brake really hard the light will flash just like on some cars with LED taillights! There is also a dimmer tail light that optionally stays on all the time. You can also choose between a round and a square pattern for both the tail light and the brake light. NOTE: Always use proper bicycle lights when riding at night! This is just a novelty for use in your garden or in the park, not on the road! Here's the source code as a JSZ file, BrakeTailLight.jsz, which can be imported into the editor (and run on a real micro:bit after compiling yourself), OR you can use this hex file: BrakeTailLight.hex which can be both imported into the editor and run directly on a real micro:bit. Here’s a micro:bit program which simulates official Rubik’s Cube and cup stack competition timers. Like the official timers, you have to hold both buttons to start the clock, and it only stops when you’ve pressed both buttons again. This is to ensure that you’ve put down the cube / not still touching any cups. The time (accurate to 1 millisecond) scrolls across the screen digitally at the end in an easy to read mm:ss.sss format (and repeats in case you missed it). Alternatively, here is the source code as a JSZ file, CubeStackTimer.jsz, which can be imported into the editor (and run on a real micro:bit after compiling yourself), OR you can use this hex file: CubeStackTimer.hex which can be both imported into the editor and run directly on a real micro:bit. Note: This is v1.1 as I had to modify the code to fix a couple of bugs that were apparent on a real micro:bit that didn’t show up in the simulator. 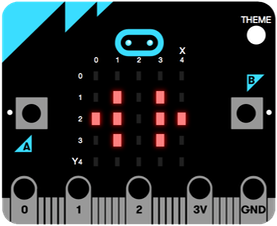 // by James Shaughnessy - See www.demonstudios.com/microbit.html for more micro:bit apps! // Feel free to change the code, reuse, remove these credits and pass on as desired! 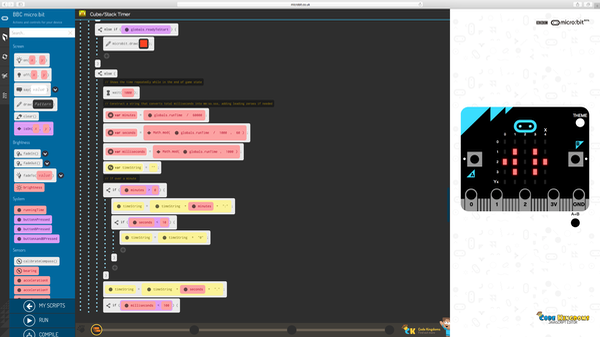 // Why not see how you could improve/optimise the code, or perhaps add new features like another clock hand. // on-board buttons, e.g. start and stop the timer by touching two bananas!